I'm doing a cull without mercy clean up of my office which hasn't been done since I put in the furniture, so it was due. I found an envelope with another bunch of collected quotes and new articles from various sources and some that I created, so I'm just going to share them. The Hormel company, manufacturers of Spam, celebrated the 50th anniversary of the luncheon meat by designating the town's July 4th celebrations as "Spam Days". Among the festivities were a "Spam-o-rama" cookoff and a "Salute to Spam" air show. A bitter strike against Hormel ended in September and not everyone has made up. "Hormel has co-opted the Fourth of July holiday and turned it into a glorifcation of pig meat in a can," said Jim Guyette, former leader of the union. T-shirts reading "Scab City, USA" and "Cram the Spam" were seen alongside company-issue Spamwear. Laissez les bon temps rouler! - pronounced: "Lay-say lay bon tom rule-ay!" Hayward Tom responded to our call for infomation on various football handicapping systems. He said he uses the Visi-Calc program for an Apple II PC to enter weekly data and compute his picks. At the 11 week mark, he was humming along nicely at 64.8%, he said. Tom added: "Good luck and I'm glad to see that Larry Stumes is over 50%. I used to use the "Stumes Factor" to pick my games. If he picked the opposite way than I did, I was sure to win. Tom was referring to back to an infamous off-year that Chronicle racing handicapper Stumes had when he was doing the football predicting. If you don't let anybody in, no one can hurt you. Question to TLC in 1990 - Have you always been this way? TLC: "The older I get, the funnier I get." Crossfire 17-Aug-88 - Senator Alan Simpson: "You're looking for something that isn't there. You're looking into George Bush's head." A riddle from a Sherlock Holmes movie - Sherlock Holmes Faces Death (1943) - Who's was it? His who is gone. Who shall have it? He who shall come. What shall be the month? The last from the first. Character name for some future story - Martin Stumbles, Esq. 2 Cents Question: Can the US regain its standing in the world? I'm not sure what will happen in the next 2 years, but I expect the worst and hope for the best. 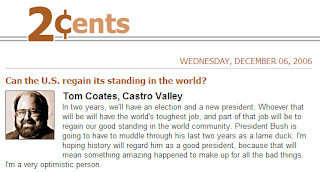 I'm not sure I'm going to vote in the 2008 Presidential election because anybody who wants to be President with the current situation might not be the smartest cookie. As Mr. T would say: "I pity the fool who wants to be the next President!" On 2-Dec-06 my worst nightmare happened. I am hurt, bruised, sprained, but OK. I can't go into details, but just for me, I'm putting a reminder in my blog. I want to mark this date to remind me. I'm feeling a lot happier even though it's painful.